Communication « Global Market Insights, Inc. 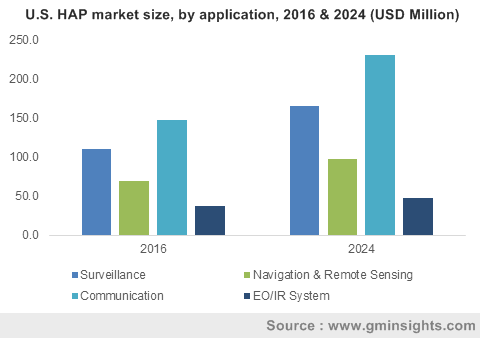 The rapidly rising demand for navigation technology, weather monitoring, and remote sensing is certain to augment satellite launch vehicle market growth over the ensuing years. Indeed, authentic surveys vouch for the vast expanse of this industry across the globe. According to the 2017 State of the Satellite Industry Reports, satellite launch services industry revenues including all commercially-competed launches of 2016, increased by 2% to USD 5.51 billion after having experienced a drop by 9% between 2014 to 2015.The rising availability of disposable income amongst the urban population has prompted the usage of mobile phones and navigation devices. Escalating use of the internet, VoIP, online digital payment services and IoT are playing a key role in the enhancement of communication. Reportedly, in 2018, the number of internet users has risen by 7% y-o-y to 4.022 billion, social media users by 13% to 3.196 billion and mobile phone users up by 4% to 5.135 billion globally. Growing connectivity requirement through radio, TV, as well as telecommunication mediums will drive the deployment of communication satellites, thereby propelling the satellite launch vehicle market over 2018-2024. Geosynchronous satellites contributed to over 65% of the overall satellite vehicle market share in 2017. Indeed close to 34 launch missions in the GEO orbits were recorded in 2017 due to their precise applications in observational data analysis and national security monitoring. The growing demand for geosynchronous satellites on account of their benefits will robustly impel the GEO orbit based satellite launch vehicle market share in the years ahead. Speaking of commercial satellites, it is prudent to mention that satellite launch vehicle market size from commercial satellites will witness a CAGR of 3% over 2018-2024, owing to the increasing requirements of these satellites in end-use industries such as earth observation, mineral & energy exploration, electronics, military, and telecom. The surge in the number of launchers incorporated with built-in automated navigation systems that are highly beneficial in the event of communication failure will positively influence the satellite launch vehicle industry share from commercial launch activities. The India space launch vehicle market has also witnessed a rapid growth in the recent years. In 2017, the Indian Space Research Organization (ISRO) launched a record-breaking 104 Nanosatellites into the orbit all using a single rocket. The Indian space agency is known for building space launch vehicles with minimum labor cost and locally sourced equipment. Reportedly, ISRO’s commercial arm, Antrix has earned Rs 5,600 crore in the last three years, solely through the commercial activities including the launch of commercial satellites as well as remote sensing services. It is thus rather overt that India SLV market stands to gain considerable returns in the ensuing years. Driven by the efforts of economies such as India and China, APAC SLV industry trends are expected to undergo a dynamic change over 2018-2024. Major players of SLV market include NASA, SpaceX, Blue Origin, Virgin Orbit, United Launch Alliance, Boeing Space and Communications, E Prime Aerospace, Bristol Spaceplanes, Mitsubishi Heavy Industries, Eurockot, Indian Space Research Organisation (ISRO), Stratolaunch Systems, Kelly Space & Technology, Lockheed Martin, Scaled Composites LLC and Northrop Grumman Corporation. Industry participants are currently forging mergers in a bid to reduce SLV development cost and increase the chances of achieving successful launch missions. In 2017 for example, NASA collaborated with SpaceX in a move that led to savings of millions of dollars. Satellite Launch Vehicles (SLV) carry satellites and payloads from earth’s surface to space. Launching an SLV requires high precision, accuracy, power, efficiency and immaculate planning. 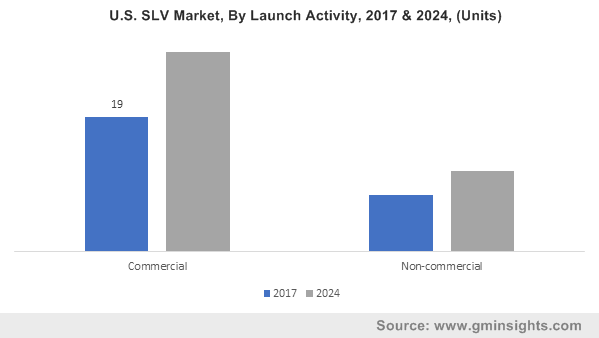 Most of the SLVs are designed for one-time use however, upcoming advance SLV technologies introduced by companies like SpaceX would offer use of a single SLV multiple times eventually saving millions of dollars’ worth of capital. In essence, the efforts of leading contenders is likely to aid the growth of SLV industry, slated to hit $2.4 billion by 2024. This entry was posted in Automotive & Transportation and tagged Commercial, Communication, Earth Observation, GEO, Launch Activity, LEO, MEO, Meteorology, Navigation, Non-Commercial, Number Of Payloads, Orbit, R&D, Remote Sensing, Satellite Launch Vehicle Market, Satellite Launch Vehicle Market Share, Satellite Launch Vehicle Market Size, Scientific, SSO. As digital disruption strongly paves its way in the communication sector, commercial satellite launch service market players are looking for new ways to manage their business models. In this regard, many companies have been adopting satellite launches as a protuberant enabler. A classic example of the same is that of Spaceflight, which has recently announced to revolutionize the space business by delivering a new model for rideshare. The company plans to provide a straightforward & a cost effective suite of services including navigational and rideshare launch offerings. As per authentic sources, the company has partnered with Rocket Lab for three upcoming launches. The first Electron mission will launch a BlackSky microsat for several rideshare satellite customers, while the second mission is poised to launch satellites for commercial & government organizations. The third mission, scheduled for early 2019, will launch a spacecraft from Canon Electronics. SpaceX is yet another commercial satellite launch service industry major in the line that has fired one of the largest commercial communication satellites into the orbit to provide GPS, internet, data, and other communication services to the emerging economies across the Asia Pacific and MEA belts. SpaceX, earlier in the month of May had also launched five commercial communication satellites for a ride-share mission. These communication satellites are expected to provide global broadband services, reliable connection for the aviation, land-mobile, and Internet of Things with allegedly higher throughputs and faster speeds. Analysts deem that the increasing investments and expansion strategies in the communication sector will quite overtly have a powerful impact on the growth prospects of the global commercial satellite launch service market. With novel growth opportunities and further technology interventions poised to disrupt this space, commercial satellite launch service market is anticipated to surpass USD 7 billion by 2024. The market for small satellites or the so called SmallSats has expanded rapidly in the past few years and is expected to account for 29% of the overall commercial satellite launch service industry revenue share in the coming seven years. The advancing technology trends that prioritize lightweight and microcomputer components have allowed the commercial satellite launch service market players to build much smaller and lightweight satellites ultimately leading to significant cost reductions. These factors have thus been playing a key role in making Smallsats appealing enough to be deployed across the commercial, government, and defense sectors. Owing to the recent surge in the interest in small satellites, the overall commercial satellite launch service market is undergoing a progressive overhaul across its value chain housing the low-weight & cost effective business model of small satellites. If estimates are to be believed, over 25 commercial small satellite operators are planning to launch constellations of 20 to 4,425 satellites down the line of 3 to 5 years. It is prudent to mention that in this regard, SpaceX has been standing tall, having planned to single handedly fire 12,000 small satellites for low earth orbit connectivity solutions. Reliable reports further estimate more than 11,000 small satellites to be launched by 2030, given the essential value proposition offered by these products to end-users. Beyond small satellites, the micro segment of the commercial satellite launch service industry is also expected to gain significant momentum as the satellite industry continues to launch reliable & affordable vehicles. Reports in fact claim micro satellites to witness highest annual growth rate at 6% over 2018-2024. Analyzing these industry trends, it wouldn’t be wrong to quote that small & micro satellite segments are now developing as lucrative investment grounds for potential stakeholders of this vertical. Undoubtedly, innovative & cutting-edge product developments by prominent commercial satellite launch service industry players have played a pivotal role in impelling the revenue graph of this business sphere. That said, the Smallsats rush, according to industry experts is certain to hop onto the growing quest of new & existing companies to scale their commercialization matrix. With industry magnates further locking multi-billion dollar investments, this business sphere is certain to tread along a lucrative growth path. A report by Global Market Insights, Inc., estimates commercial satellite launch service market to record a y-o-y growth of 2.5% over 2018-2024. This entry was posted in Automotive & Transportation and tagged Commercial Satellite Launch Service Market, Commercial Satellite Launch Service Market Report, Commercial Satellite Launch Service Market Research, Commercial Satellite Launch Service Market Share, Commercial Satellite Launch Service Market Size, Commercial Satellite Launch Service Market Trends, Commercial Satellite Launch Services, Communication, GEO, HEO, Large, LEO, Medium, MEO, Micro, Navigational, Orbit, Reconnaissance, Remote Sensing, Small, Weather Forecasting. With significant advancements in artificial intelligence and wireless technologies, high altitude platform market is expected to witness remarkable growth in the coming years. The emerging market for broadband data provision and multimedia are highly impacting the growth of projects – that are launching terrestrial and satellite systems for enhancing wireless and internet services. Airships, tethered aerostat systems, unmanned planes, and so-called pseudo satellites are some of the most significant high altitude platforms that are been used to enhance global communication, wireless technologies, and surveillance applications. Statistically, it has been observed that the application scope and involvement of special deep-pocketed proponents have significantly led high altitude platform market to cross the billion-dollar frontier in 2016. According to the estimates provided by Global Market Insights, Inc., high altitude platform market size was over USD 1 billion in 2016 and is expected to surpass a valuation of USD 1.5 billion, expanding at 5% CAGR over 2017-2024. Speaking of the prominent companies expanding their reach in the high altitude platform industry, the social media giant Facebook and leading aerospace manufacturer Airbus are teaming up to develop their separate solar powered unmanned airships. As per reports, these systems are designed to fly above the height of 70,000 feet to provide the broadband internet service in the remote areas. Another recent development witnessed across high altitude platform market is of Google, who has successfully launched HAP projects such as Loom and Skybender to beam internet services to the underserved and rural location across the globe. These instances clearly validate the recent developments spanning the installations and commercialization of UAVs, satellites, and drones, that, in turn, is certain to boost the revenue stream of overall high altitude platform industry. Interestingly, telecommunications and wireless networks are not the only thriving application segments of high altitude platform market. Analysts deemed that surveillance application of HAPs dominated the business sphere, on account of its rising demand from the military and public safety sectors. The profound significance that these high altitude platforms hold in identification of criminals, terrorist attacks, and tracking activities have remarkably uplifted the demand of HAPs in surveillance applications. The recent instance of the sniper attack in the Las Vegas accounted for more than 59 deaths and 527 injuries, which has drastically impacted the business operations of HAP market. It is noteworthy to mention that, such situations demand strong surveillance, wherein the HAP plays an important role in providing clear and concise images of objects from distance. In this scenario, several governments of countries including U.S., UK, and India have initiated grants for companies operating in the high altitude platform industry to enhance the research and development of these platforms for defense purposes. Reports claim North America and Western Europe to be the leading regions witnessing high adoption of HAPs in military and naval forces. For the remote sensing purpose, HAPs have an important advantage of low orbits and longer timespans over satellites. This has favored HAPs to permit better resolution images on account of being comparatively closer to the covered areas. High penetration of UAV aircraft coupled with strong spending on other LTA systems are identified as the prime factors responsible for surging growth of high altitude platform industry. As per reports, U.S. is anticipated to be a major region dominating the regional high altitude market landscape. Also, considering the worldwide demand for HAPs, Asia Pacific is projected to be another lucrative growth ground for HAP market expansion. The rising adoption of the technology, especially in the emerging countries of South-east Asia, for telecommunication and remote sensing purpose, is expected to drive the APAC industry demand. The region is further expected to observe strong foothold in the global high altitude platform industry, owing to the rapid involvement of regional governments in tackling foreign & internal conflicts, smuggling, and terrorist activities. Given the extensive adoption of HAP technology on the global level, it is prudent to mention that these systems will be a prominent part of the modern-day infrastructure developments. Driven by the diversified application matrix and rising participation of tech giants to harness this technology, analysts affirm the global high altitude platform market to witness a rather profitable roadmap down the line. This entry was posted in Electronics and Media and tagged Airships, Communication, EO/IR System, High Altitude Platform Market, High Altitude Platform Market Report, High Altitude Platform Market Research, High Altitude Platform Market Share, High Altitude Platform Market Size, High Altitude Platform Market Trends, Navigation, Remote Sensing, Surveillance, Tethered Aerostat Systems, UAV. The growing technological advancements in IoT coupled with the rising demand for smart connected devices will drive single board computer (SBC) market in the years to come. Basically a compressed, low-cost version of a typical computer, an SBC comprises similar components such as microprocessors, memory, input/output (I/O) and other features all embedded on a tiny circuit board. The product has become significantly important for developers seeking ways to design products with greater intelligence, performance and connectivity while reducing power consumption, costs and size. Indeed, the product continues to evolve in sophistication, while its range of possibilities expand. For instance, nowadays SBCs come with features like Bluetooth and Wi-Fi compatibility making them ideal in applications associated with IoT (Internet of Things). The deployment of the Internet of Things (IoT) in almost all industrial applications will significantly boost the growth of the SBC market in the years to come. By using SBCs, manufacturers are now able to offer efficient IoT solutions to customers. The product has certainly propelled the growth of the IoT sector in the last few years, offering a much smoother commercialization. According to reports, business infrastructure and operations professionals are rapidly shifting towards IoT, while studies indicate that a major proportion of decision-makers are already using IoT-enabled applications from building connected products to transforming operational processes. With rising IoT adoption, IoT software providers like IBM, Cisco, Amazon, GE, and other giants are now developing solutions that simplify the design, creation, integration, and management of IoT infrastructure and enterprise data. This in consequence will majorly propel the product demand, eventually pushing SBC industry trends. Semiconductor processors, being the core of any SBC, are rapidly evolving to match the capability of modern day applications. To attract the vast tech-savvy customer base, engineers are constantly adopting advanced embedded technologies to gain a competitive edge. For instance, the neural processing unit (NPU) is anticipated to be the next focus for chipmakers as it helps speed up computer-vision applications, such as object and image recognition, and offers enterprises and manufacturers a more powerful platform for developing products used from smart building applications to driverless vehicles. Prominent companies are investing heavily in the development of these new technologies. The Chinese tech giant Huawei, in collaboration with Linaro, recently launched its new SBC called HiKey 970 AI computing platform which uses the world’s first AI mobile processor, Huawei’s Hisilicon Kirin 970 chipset along with a dedicated Neural Processing Unit (NPU). This is quite vividly, an instance that demonstrates how product innovation and investments in technological advancements will add momentum to the expansion of the SBC industry. Powered by rapid technological developments, single board computers have paved their way into medical sector as well. Medical devices are increasingly being integrated with SBCs to perform and monitor a wide range of clinical processes. The product’s reliability, power and versatility have made it ideal for developing customized medical electronic devices, medical monitoring systems, fault-tolerant wearable computers and more. Strategic partnerships between tech giants and medical healthcare firms will thus majorly augment the growth graph of SBC industry. While SBC market has quite appreciable consolidated itself worldwide, the APAC is said to emerge as a prominent revenue pocket for this industry in the years to come. This may plausibly be the case on account of the expanding electronics industry in the region. With the presence of several consumer electronics and tech firms, the APAC SBC industry is anticipated to depict considerable growth over 2019-2025. Growing government support toward building in-house consumer electronics, such as smartphones, tablets and other gadgets in countries like India and China, will also boost the APAC single board market demand. Being highly-scaled versions of traditional PCs and laptops, SBC are expected to continue finding long-term application in IoT-driven verticals and consumer electronics. 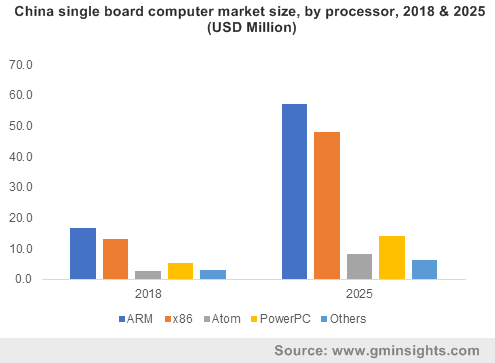 Powered by rapid technological advancements in semiconductor processors and AI, single board computer market is forecast to chronicle itself in the billion-dollar business sphere by 2025. This entry was posted in Electronics and Media and tagged Aerospace & Defense, Aftersales, ARM, Atom, Communication, cPCI, Customization, Data Processing, Entertainment, Global Single Board Computer Market, Industrial Automation, Medical, PowerPC, Research, Single Board Computer Market, Single Board Computer Market Share, Single Board Computer Market Size, System Integration, Test & Measurement, Transportation, VME, VPX, x86, xTCA. 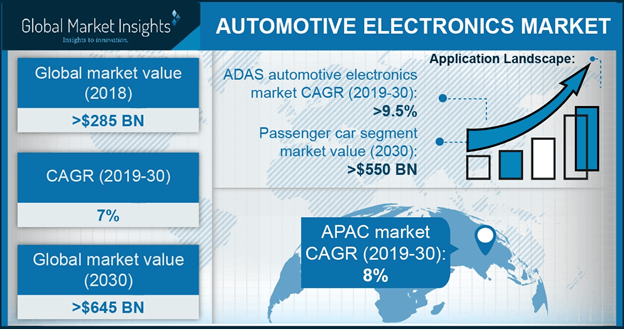 Automotive electronics market, in recent times, is on the verge of emerging as a niche vertical, pertaining to the high demand for infotainment and security systems in vehicles. Many of the automotive giants of today are installing advanced and high-performance infotainment systems to enhance efficacy of vehicles. For instance, recently, Renesas Electronics signed a deal with the renowned automaker, Toyota Motor Corporation to implement its automotive technology in Toyota’s upcoming self-driving vehicles. This technology consists of the high-performance R-Car system-of-chip (SoC), used as the brain for advanced driver assistance systems and in-vehicle infotainment system of vehicles. The deployment of such systems to maintain passenger and vehicle safety is thus slated to impel automotive electronics industry share. Over the coming years, the use of real-time operating systems and the development of next-generation visualization tools for automotive in-vehicle systems is likely to increase at an exponential rate. 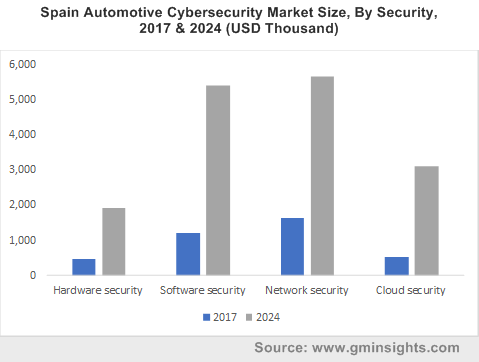 The surging awareness among people about the benefits of autonomous vehicles will thus help augment the utilization of electronic content in automobiles, thereby fueling automotive electronics market share. The recent advancements in digital technologies such as IoT and AR are expected to substantially enhance the performance of vehicles. In this regard, some of the tech giants are looking forward to implementing image sensors to improve functional safety features. Recently, the European Parliament announced that it may be planning to mandate the use of safety equipment for all newly manufactured cars. The safety equipment includes intelligent speed assistance, autonomous emergency braking (AEB), and seatbelt reminders. Currently, the autonomous emergency braking system is becoming more common among new cars pertaining to the growing awareness about the importance of road safety. Moreover, the deployment of norms by the European Union related to the fuel economy and emission control has encouraged automakers to use more electronic content, which will significantly stimulate Europe automotive electronics industry trends. Of late, regional governments have been observed to be deploying stringent rules and regulation to curb environmental pollution, mainly caused due to the release of carbon content into environment. In 2012, the American National Standards Institute (ANSI) had released a standard roadmap to deploy electric vehicles and to implement changing infrastructure across the United States. In order to comply with regulatory norms, many automotive giants and start-up companies have shifted their focus toward the development of electric vehicles. In this regard, to fulfill the increasing requirement of electronic content, most the players in automotive electronics market have been making heavy investments on the advancement of supply components. For instance, Panasonic has developed a new software in cooperation with Azapa to speed up the development cycle of products. Speaking of which, some of the well-known behemoth in automotive electronics industry are Denso, Avago Technologies, Wipro, Delphi, Continental, Bosch Group, Panasonic, and Hitachi Automotive Systems. The rising automation and digitalization in automobiles have had a considerably positively impact on automotive electronics market trends. Tech giants have been adopting tried-and-tested strategies of joint ventures and M&As to set renewed frontiers for profitability. In fact, recently, Intel and Mobileye have signed a collaboration to develop self-driving cars. Even Panasonic is reported to have partnered with Tesla to manufacture batteries for vehicles. Strategic alliances such as the aforementioned, in conjunction with the growing electrification in automotive sector are likely to boost automotive electronics market. 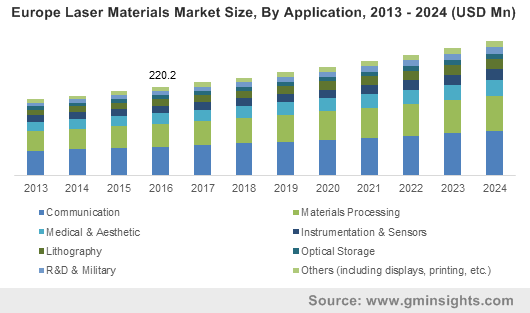 According to Global Market Insights, Inc., automotive electronics industry will generate a mammoth revenue of more than USD 400 billion by the end of 2024. This entry was posted in Automotive & Transportation and tagged Adaptive Cruise Control, ADAS, Audio, Automated Emergency Braking, Automotive Electronics Industry Analysis, Automotive Electronics Market, Automotive Electronics Market Forecast, Automotive Electronics Market Growth, automotive electronics market share, automotive electronics market size, Automotive Electronics Market Trends, Blind Spot Detection, Body Electronics, Commercial Vehicles, Communication, Display, Engine Controllers, Exhaust, Head Up Display, Infotainment, Lane Department Warning, Navigation, Night Vision, Parking Assistance, Passenger Cars, Powertrain, Safety Systems, Transmission Drivetrain, xEV.